People riding in an open air carriage pulled by a horse might be considered quaint if it wasn’t an indication of the troubles that beset the suburb of Moyross. Horses are sometimes used for transport, but they are often abandoned and left to wander through the gritty neighbourhood or a nearby field. That is also where the drug deals go down. Burnt out and boarded up houses are easy to find and so is poverty. 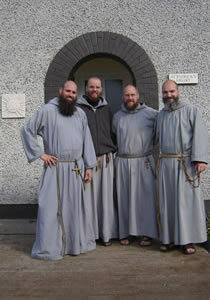 It is just the kind of place the Franciscan friars of the Renewal were looking for. O’Connor and four other monks opened their friary here in 2007 by converting three abandoned houses into a simple residence and chapel. Shortly before they moved in, they got a reminder of how tough the neighbourhood was. Two children were nearly burned to death when three teenagers firebombed the car they were sitting in. But O’Connor and the others saw a need and over the last three years they have worked hard to get to know the community. Out on the street, O’Connor is trying to use the offer of cookies and chocolate to get a group of boys to talk about the meaning of Christmas — with mixed results. “Tell me one thing about Christmas” O’Connor said. “Uh, you get stuff from Santa,” one boy replies. O’Connor presses on, asking them what they need to do before they can have a cookie. “Say please and thank you,” says another. After more coaxing, O’Connor gets the answer he was looking for as the troupe began to pray. The boys, small and freckle-faced, sound like well rehearsed angels. But just steps away are a reminder of that appearances can be deceptive. The friary’s statue of the Virgin Mary is missing her hands. One of the other boys living near here cut them off a few months back. This entry was posted in Religion News, Religious Orders and tagged Catholic Ireland. Bookmark the permalink.